RoseHosting Review 2019: Is RoseHosting a Good Hosting? 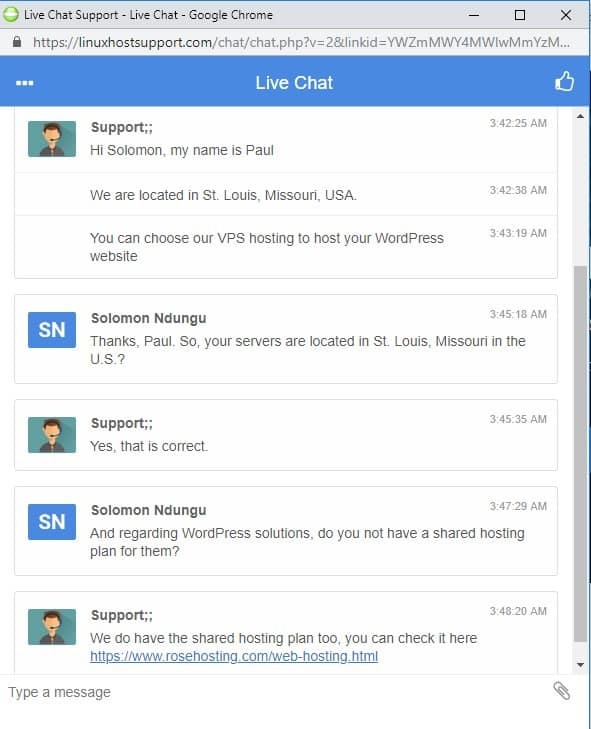 I signed up to RoseHosting, reviewed their unique features, tested how easy they are to use, checked with support on several issues, and tested the speed of the live site. When done, I tried to cancel my account and receive a refund. This is my experience with RoseHosting - I hope you can learn from it. RoseHosting is the web hosting brand of parent company Rose Web Services LLC, a privately owned company located in St. Louis, Missouri. Established in 2001, this vendor offers hosting services to businesses of all sizes in the U.S. and elsewhere. The company has also established presences in India, Brazil, Germany, and Poland. RoseHosting’s English language website is well-designed and can be navigated with ease. Servers are housed in a data center located in St. Louis, Missouri. The servers feature the following specifications: 128GB DDR4 RAM, 2 x Quad Xeon CPUs, and enterprise-grade SSD storage for faster load times. A redundant gigabit Ethernet-based internal network uses Cisco infrastructure. The hosting solutions use multiple operating systems, so clients can choose between CentOS, Fedora, Ubuntu, and Debian Linux distributions (plus others). This hosting firm also provides full server management and gives its customers full root access to their servers. Weekly backups are performed solely for disaster recovery purposes, and not for the convenience of customers who simply want to restore their websites. Put simply, customers are responsible for their own backups for rollback purposes. All hosting plans include free Let’s Encrypt SSL certificates, but users who want more advanced security can purchase Comodo, GeoTrust, RapidSSL, and Thawte SSL certificates through RoseHosting. Another noteworthy feature is that users can choose their preferred control panel between cPanel and DirectAdmin. RoseHosting has adopted a straightforward pricing model with monthly and yearly billing cycles and no hidden charges. Prices are in line with what other vendors are offering in the same sector. Additionally, there are several other free services, including free website migration, free DNS hosting, and free setup. You also get a 7-day money-back guarantee, which is quite a bit shorter than that of other vendors, but at least it gives you a little time to test their services. You probably won’t need to take advantage of this get-out clause in any case, because this provider has a time-tested, award-winning 99.99% uptime guarantee. If you prefer to support yourself, you’ll find that RoseHosting has a deceptively detailed knowledge base. RoseHosting seems to have invested heavily in modern data centers as well as highly qualified and efficient support staff to deliver excellent hosting solutions to businesses of all sizes. My interactions with this vendor left little doubt why they are an award-winning web hosting company. Their apparent commitment to customer satisfaction makes them popular even outside the United States. Wondering how RoseHosting stacks up against other Web Hosting companies? Enter any other Web Hosting company and we will give you a side-by-side comparison.